Not only that, the Hindi version has also become Rajinikanth's highest-grossing Hindi movie. With his latest release 2.0, Rajinikanth has done it again. The superstar's latest offering that also stars Akshay Kumar has made it to Rs 500 crore worldwide. The producers, Lyca Productions, tweeted about this milestone and said that 2.0 has redefined history. Karan Johar, whose Dharma Productions is associated with the Hindi version of 2.0 said, "A box office PHENOMENA!!!! 500 crores worldwide!!!!! We at Dharma Movies are so proud to be associated with the HINDI version of this movie marvel!!!!" Shankar's 2.0 has indeed won millions of hearts across the globe. Closer home, the Hindi version of 2.0 has been making waves. It sailed strong over the weekdays to collect Rs 132 crore in India. The movie made Rs 20.25 crore on Thursday, Rs 18 crore on Friday, Rs 25 crore on Saturday, Rs 34 crore on Sunday, Rs 13.75 crore on Monday, Rs 11.50 crore on Tuesday, and Rs 9.50 crore on Wednesday. Those numbers are staggering considering 2.0 is not originally Hindi. In fact, the Hindi version of 2.0 has overtaken Baahubali: The Beginning's Hindi version's lifetime business. There's only another benchmark to overtake - Baahubali: The Conclusion's Hindi edition. In Chennai also, 2.0 has made the record of becoming the highest-grosser over a week. Rajinikanth-Akshay Kumar's 2.0 made Rs 14.7 crore over the week. Enthiran's sequel, 2.0, has been making waves in the international box office as well. In the UK box office, 2.0 made Rs 5.35 crore. 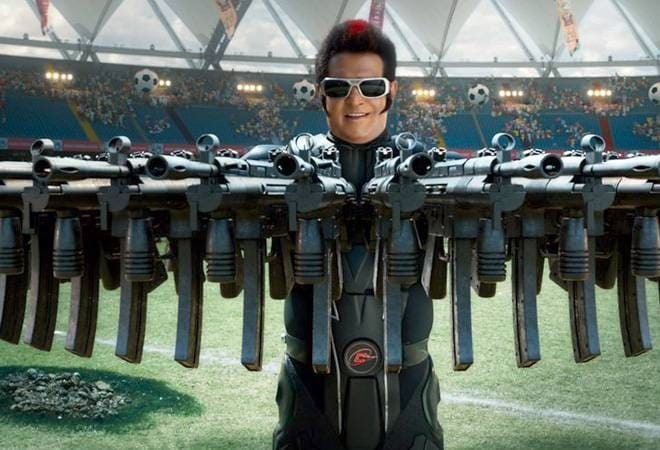 In New Zealand, 2.0 made Rs 1.10 crore, while it earned Rs 5.86 crore in Australia. In Germany, 2.0 has made Rs 13.67 lakh. As if this collection was not something to be reckoned with, 2.0 is also releasing in China - the market that loves Indian movies as much as Indians do. The Chinese market is also the king-maker. Take Dangal and Secret Superstar, for instance. Additionally, 2.0 is scheduled to release across 56,000 screens in China. That is going to pump in a significant amount of moolah to 2.0's kitty. According to reports, 2.0 is proving to be a family entertainer. Additionally, both the superstars' fans are rushing to watch the movie that has received mostly positive reviews. Fans of the first part, Enthiran or Robot, have also made their way to the theatres to watch their favourite Chitti in action. The movie's stellar VFX too has garnered a kind of interest in the movie that is seldom witnessed in Indian cinema, directing more and more people to the ticketing counters.